Okay so I’ve been rubbish at blogging lately. It’s because I’ve been too busy running desperately around my kitchen in a chicken costume protesting about the perils of factory farming in an attempt to win £25,000 cash. Seriously though, I am surviving on very few brain cells these days. The festive season has kicked in. Along with too much general good cheer and gold glitter, way too much champagne is being consumed. By no means does this spell the end of quick Indian cooking as we know it. Quite the contrary, in fact. You try drinking more than you should three nights in a row. What do you think you’ll need after that? My personal favourite is the best Spinach Dal, or Palak Masoor Dal laced with ginger, spinach, ghee and a medley of soothing spices. I can say from experience: this stuff cures like no other. And requires very few brain cells to make. All in all, an excellent choice for tomorrow night’s supper when I’ll be nursing a sore head from tonight’s office Christmas party. I won’t wear my chicken costume. But I can’t promise I’ll behave. Wash the lentils in a large pan thoroughly with cold water until it runs clean. Fill the pan halfway with cold water, add the turmeric and bring to boil over a high flame. This takes about five minutes and you’ll need to watch the lentils to make sure the water doesn’t boil over. If it does just take the pan off the flame for two seconds, swear and move on. As the water froths up, skim the surface with a wooden spoon and throw the scum away. Keep boiling the dal on a medium heat until the lentils start losing their shape and integrating with the water. In the meantime, cook the frozen spinach in the mircorwave for five minutes or on the cooker with a tablespoon of water. When the lentils resemble a fibrous soup, mix in the spinach. Add half a cup of hot water only if the mixture dries up. You want this to have a thick, smooth soup-like consistency. While the goodness of the spinach spills into the dal, make the tarka or tempering. Bring a small pot with the ghee to heat to heat over a high flame. When it is hot, add in order the whole chilli, minced ginger and the chilli powder. Fry for about two minutes and then stir into the dal. Lower the flame to a gentle simmer and stir the dal well to mix in the flavours. Serve hot with hot brown basmati rice, mango pickle and keema for a full Indian meal that really hits the spot. PS = Have you contributed to Menu for Hope yet? Johanna of The Passionate Cook is hosting the UK effort. I am trying to work out how to get my extra special gift over from India by this Friday. Yikes! PS = If you are looking to treat your kitchen to something special this year, please buy something from Pampered Chef. My sister-in-law is helping raise funds for unwanted pregnancy support charity The Place. You need to click on How to Purchase, type Lex in the first name box and then buy with reckless abandon. first time here….was rofl after reading the lentils boiled to death bit!! i kindof know how you’re feeling cos i am reeling under too much socialising too and the festive season has just about kicked in!! cheers !! That was a delightful post, loved the dal! I made this last night, along with the keema. It was DELICIOUS, even though I accidentally used chopped spinach instead of whole. 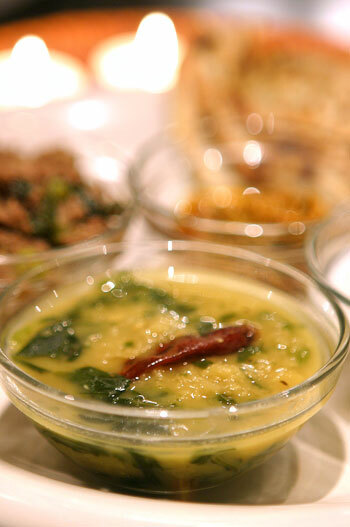 The daal was so buttery and luscious, the keema wonderfully spicy, but balanced — together a yummy meal. Thanks! I absolutely love your blog and find many of your post’s to be exactly I’m looking for. Do you offer guest writers to write content available for you? I wouldn’t mind writing a post or elaborating on a number of the subjects you write about here. Again, awesome blog! I’m console acquisition from you, but I’m disagreeable to win my goals. I dead eff representation all that is posted on your site.Enter the tips coming. I enjoyed it!